Each year, Bryce Canyon National Park presents the weekend-long Bryce Canyon Winter Festival. Red, mountainous rocks decorated with snow welcome festival participants to partake in outdoor activities, arts and crafts, and health and wellness activities, just to name a few! The 2019 festival will take place on Feb. 16, 17, and 18. With so many fun-filled events for all ages included in the festival, it can be difficult to pick an choose which ones are right for you. That’s why we’ve compiled a guide to help you decide which activities best suit you and your group! 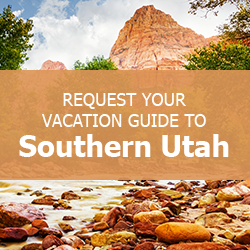 Make planning your trip to Southern Utah easier when you download our complimentary Vacation Guide packed with local suggestions on restaurants, other events, and outdoor activities! Why Not Try Something New at the Bryce Canyon Winter Festival? Tall spires of red rocks that make up Bryce Canyon National Park are the perfect backdrop for the Bryce Canyon Winter Festival outdoor recreation activities. The national park offers participants beautiful scenery to take in as they race, bike, and hike through the beautiful surroundings. You can choose from a wide range of winter activities like the cross country races, snowshoe tours, and hikes. If you’ve never been on a fat bike before, hop on one during the festival and ride through the national park’s snowy terrain. Although the mountains are covered in snow, the crimson color still comes out to play underneath, making the perfect background for a photo to commemorate an experience you’ll never forget! Arts and crafts aren’t just for kids at this festival! Head to the Red Canyon Room in Ruby’s Inn to create art projects of all sorts including cookie decorating, watercolor painting, pottery, and a special, new-age photography workshop. The Photo Workshop teaches adults how to maximize their use of smartphone cameras. Share and hear tips and tricks from others on how to capture the best photos right from your devices. The festival is not just all about fun and games, but also wants to help you become your best self! Start your mornings off at the festival with mindfulness and yoga. Beginners and seasoned yogis are welcome to partake in a Hatha yoga class focused on building strength. Learn breathing techniques and new poses while relieving mental stress. A certified nutritionist will also be on-hand during to inform participants about healthy eating. Gain insight into the best diet for your lifestyle and discover how to incorporate sustainable eating into your daily life. Informative workshops on relationships and safe running methods will also take place throughout the weekend. Attend one of many educational classes and lectures to hear more about Southern Utah’s unique landscape and wildlife. Marvel at North America’s largest fowl (the condor) during the bird demonstration. Guest speakers and experts will hold discussions and talks throughout the weekend to inform participants on a range of topics related to Utah’s beautiful wildlife and landscape. Bryce Canyon National Park is known for its unusual appearance and is also listed as the No. 1 Utah national park you need to visit in the winter. Discover the science behind these remarkable rock formations at the Geology Talks. During a weekend packed with exciting events, you’ll want a comfortable place to stay near the festival. Consider one of our Panguitch vacation rentals, just a short drive from the Bryce Canyon Winter Festival! Or choose from luxury cabins like the Grand View Lodge that can accommodate up to 25 guests. Or, stay right on the lake in this pet-friendly Panguitch lake cabin. We have the perfect accommodation for you, no matter who you’re traveling with! Don’t wait, the festival is coming up soon! Check our availability and start planning your escape to Southern Utah today!